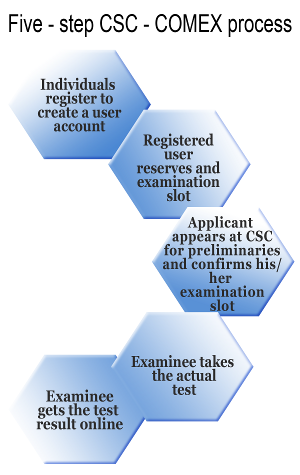 In EAR, an individual interested to take the computerized examination can register online via the CSC-COMEX website by creating a user account (to create a user account, one must have an existing and valid e-mail account). He/she will then be asked to provide information such as personal circumstances, education, employment, examinations passed, and civil service eligibilities. In ESR, the COMEX will notify registered users of online offerings including the type of examination, number of slots, date and time of personal appearance, date and time of examination, and examination venue, A registered user can choose from any of the available schedules and reserve an examination slot. The ATP pertains to the proper which will involve, among others, the ramdom assignment of each examinee to a test form and a testing computer, the authentication of examinees’ biometrics, and the actual taking of the test. In TRP, the examination results will be processed and the examination reports generated, after which, the examinee can immediately access his/her score online. Data will be backed-up and PSP data submitted electronically to the CSC-Integrated Records Management Office (IRMO).